I just discovered the world of reading challenges and I just can’t get over how much fun it seems. Unfortunately, most of the ones I’m interested in don’t start until early ’08, which left me wanting something to bite into right now. 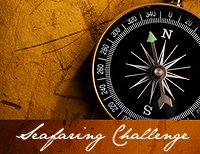 Thankfully for me, I then stumbled upon the Seafaring Challenge which started only a couple of days ago. Basically, it’s the perfect match as I completely adore nautical books. The challenge runs from November 1st, 2007 to January 31st, 2008, so I’m not going to make my list of books terribly long, but I do plan on reading at least four (which ought to earn me the rank of Admiral). Challenge ended on 31st of January, 2008, by which time I’d reached the rank of Commodore.